The Office of Development and Alumni Affairs keeps in touch with alumni and friends to keep them informed and let them know how they can help. The office also seeks gifts from alumni, friends, corporations and foundations to keep the school at the top. Students and alumni are encouraged to utilize the online alumni directory, which is useful as a networking tool and allows users to search by class year, geographic region and other means to locate alumni. The office also sponsors spring and fall break trips for students to network with alumni working in communications professions in major U.S. cities. The dean’s office is the information hub of the school and serves students, faculty, staff and visitors. In addition to the dean, the office houses the senior associate dean of undergraduate studies and the senior associate dean of strategy and administration. Requests for room reservations, OneCard access and temporary parking are managed by the front desk. Feeling a little lost? Look no further! UNC-Chapel Hill Facilities Planning and Construction has a searchable campus map. The MJ-school is housed in Carroll Hall, located off UNC's main quad. The closest visitor parking to Carroll Hall is the Morehead Planetarium, located just off East Franklin Street in front of the Morehead Planetarium and UNC Visitor Center. 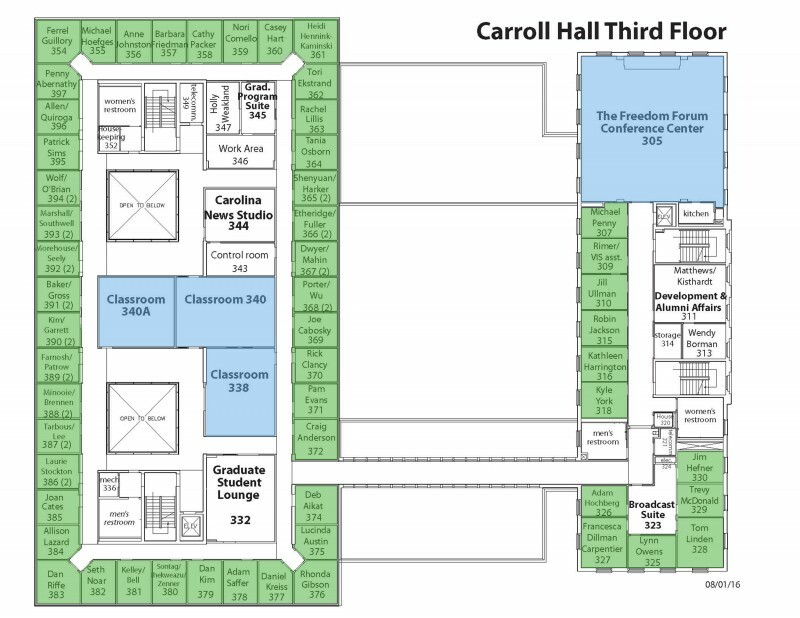 The Office of Development and Alumni Affairs resides on the third floor of Carroll Hall, next to the Freedom Forum Conference Center. Visitors can access the office from either of the two stairwells at Carroll Hall's main entrance. 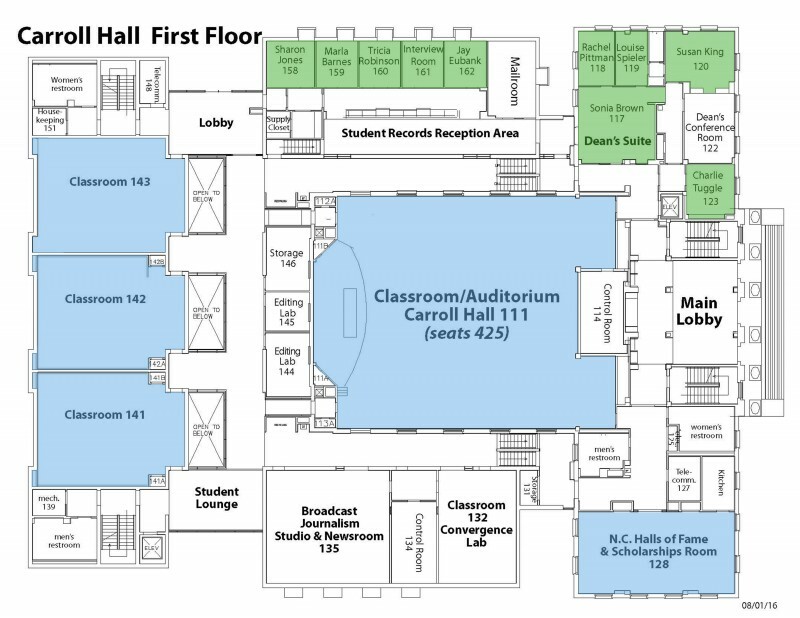 The Dean's Suite is located next to student services on the first floor of Carroll Hall. After entering the main lobby, take a right and the suite is straight ahead at the end of the hall.